I'm really kinda picky. It's sad, really, but it's true. There's a whole list of things I won't eat. But my pickiness also has an upside: when I love something, I really, really love it! Case in point: green smoothies. OMG, yummy! Many people (like my little sister) think green smoothies are weird, but they're not! It's just a regular smoothie*, with some green added in. Sorta. In true Lexielicious fashion, I hereby present you with my tutorial on how to make the most awesome green smoothie ever! If you've known me for awhile, you know I don't do recipes. So it only makes sense my smoothie "recipe" is gonna be more of a guide. You get to pick and choose and make things to YOUR taste! I insist! The heart of my green smoothies is kale**. Here's my secret: I buy fresh organic kale (whichever looks freshest) and when I get home, I immediately chop it up and put it in the freezer (in a ziplock bag). Voila! Frozen fresh kale! So, grab a bunch of frozen kale. Add in fresh or frozen fruit (in these photos we have frozen mango and a cherries and berries mix from Trader Joes, I think). Often, those two things (and water to cover) are the only ingredients in my smoothie. On this day, I wanted a creamier feel, so I added almonds. And some green powder I got that I'm trying to use up. Other weird add ins I've tried are frozen zucchini (loved it!) and different types of seeds/ nuts. I'd love to have enough avocados to feel like adding one to a smoothie, but I'm greedy in my love of avocado and always end up eating them! YUM! Also in this smoothie: coconut cream. (Which is oh so delicious and don't talk to me about what's in it!) I didn't need any sugar/ honey because the coconut cream is really sweet. Coconut milk also works, as does coconut water. You can use your favorite sweetener. Add water, juice or tea (yes, I said tea. I've been experimenting with tea smoothies! 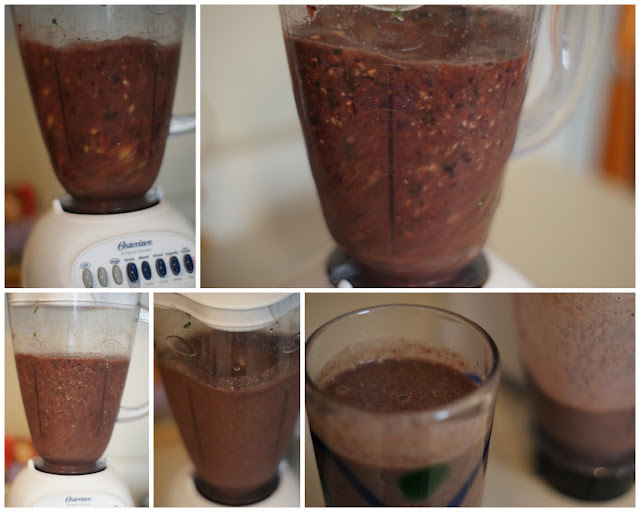 ), making sure to cover the fruit/ veg and then blend the heck outta it! 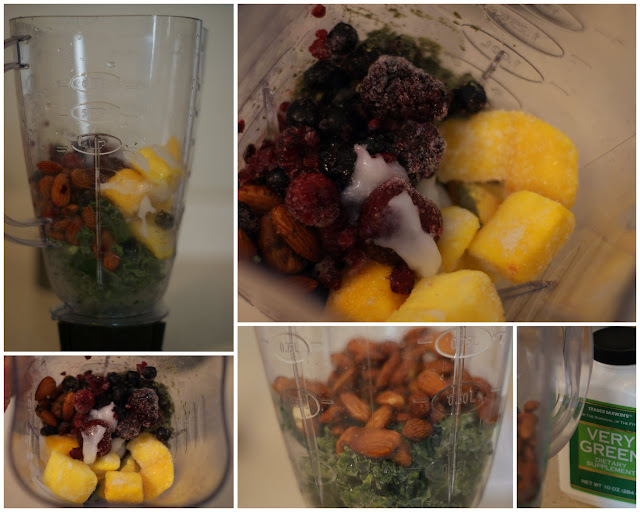 And there you have it, a delicious, awesome smoothie! * I do have to note that Remy will not drink green smoothies, although he likes "regular" smoothies. Also, I used to add yogurt and milk to my smoothies, but after reading about vegan raw smoothies, I started experimenting and I found I really just liked the taste of the fruit and kale. ** Spinach is also popular for green smoothies, but I'm not a huge fan. I hear it tastes better with citrus fruit, though.